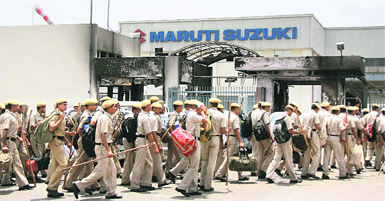 Concerned at the safety and security of its supervisory and management personnel, country�s largest car-maker Maruti Suzuki India Ltd (MSIL) today declared a lockout at the violence-hit Manesar plant. 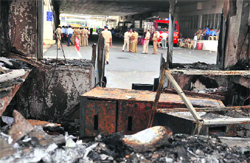 The situation prevailing on the Manesar campus of Maruti Suzuki India Ltd (MSIL) following arson and assault on senior executives and managers has exposed the failure of the company management as well as the state Labour Department in anticipating the impending crisis and not taking timely steps to prevent such a drastic fallout. The Centre today reviewed the progress of monsoon and sowing of kharif crops in six major states, including Punjab and Haryana, which are facing the brunt of an extremely erratic monsoon. Even as an unhappy NCP persisted to air its grievances over the functioning of the UPA government, the Congress stepped up its efforts to mollify its estranged ally ahead of its crucial meeting on Monday called to decide on the future contours of its relationship with the ruling combine.